This article is about the toy from the Mario vs. Donkey Kong series. For the transformation of Luigi after he collects a Mini Mushroom, see Mini Mario (form). Mini Luigi is a Luigi toy created by the Mario Toy Company that debut in Mario vs. Donkey Kong: Tipping Stars. It acts just like a Mini Mario toy. As with Mini Peaches, Mini Rosalina, Mini Bowsers, Mini Bowser Jr.s, Mini Yoshis, and Mini Diddy Kongs, however, the character Mini Luigi is based on does not appear in the series. 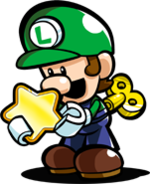 Like the other mini toys, Mini Luigis must be guided through levels, and to complete a level all of the mini toys must be guided to the door in a limited time period. As with Mini Marios, Mini Luigis are voiced by Charles Martinet. To unlock them in the Workshop Store in Mario vs. Donkey Kong: Tipping Stars, they must be bought with 150 Stars in the Clattering Cabin section. Mini Luigi makes a return in Mini Mario & Friends: amiibo Challenge. In the game, Mini Luigi is able to jump up at great height, enabling him to reach higher ground. This trait is shared with Mini Rosalina, although Mini-Luigi jumps at lesser heights compared to her, in exchange for moving one space forward in the process. This page was last edited on July 14, 2018, at 14:00.